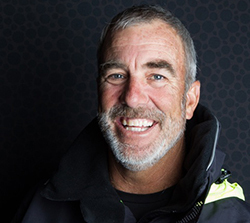 North Sails has announced that Kimo Worthington, former general manager of PUMA Ocean Racing for the past two Volvo Ocean Race events, has been named sales manager of North Sails in North America. An experienced sailor and marine industry opinion leader, Worthington will work at the new North Sails corporate office in downtown Newport, RI. "It is a very exciting time for North Sails as we make some management changes and reassign roles and responsibilities within our sales force," said Ken Read who was named president of North Sails Group in December. "As the general manger of PUMA Ocean Racing, Kimo was privy to the sales and design process for our sail program and developed many strong relationships with key leaders within North Sails. He brings with him a fresh look and fresh approach to help motivate and inspire our sales force, which makes him a natural fit at North Sails where client services are a top priority," Read said. Worthington has been involved with competitive sailing since 1974 and started his career in sailboat project management in 1982 when he worked for the Davidson 46 Pendragon. He has worked with six America's Cup teams as sailing team manager/coach and he has worked on a total of four Volvo Ocean Race teams. He is one of very few marine industry leaders who has worked on both a winning America's Cup team (America3 in 1992) and sailed on a winning Volvo Ocean Race team (EF Language in 1997-98). Worthington is a talented sailor who has participated in many premiere grand prix yachting events including the Transpacific Yacht Race; Admiral's Cup; Kenwood Cup; and Farr 40 and Melges 24 World Championships just to name a few. professionals so I am proud and honored to be part of the North Sails team."